Subscribe: Do You Get Your Local Observer Paper? The Business Observer is unlike any other business information medium in Florida. Its content is geared specifically for Southwest Florida’s business leaders. With comprehensive, authoritative coverage of Polk, Pasco, Hillsborough, Pinellas, Manatee, Sarasota, Charlotte, Lee and Collier counties, the Business Observer is the only weekly business newspaper that provides business leaders, entrepreneurs, CEOs and investors with a regional perspective. The Business Observer is also the leading publisher of public notices on the Gulf Coast of Florida. The inside scoop on the latest news about people, companies and issues. Short reports and features highlighting companies and businesses doing the unusual. Snapshots of the latest municipal, county and state government policy decisions and how they affect the business environment, taxation and development. Regular reports and analysis of the Gulf Coast economy, local economic snapshots, demographics and trends. In-depth reporting that explores the strategies—and the lessons to be learned—of the region’s emerging and leading companies. Q&As to learn what’s important and what’s on the minds of Gulf Coast business leaders.. This "Out of the Office" column features occasional reviews of restaurants recommended by executives in cities on the Gulf Coast, from Tampa to Naples. Regional roundup of each week’s top commercial real estate transactions—who’s buying, who’s selling... and for what price. Publisher Matt Walsh’s popular free-market commentaries on business and public policy decisions affecting the marketplace. 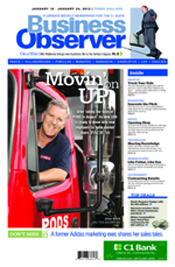 Flip through an issue of the Business Observer.